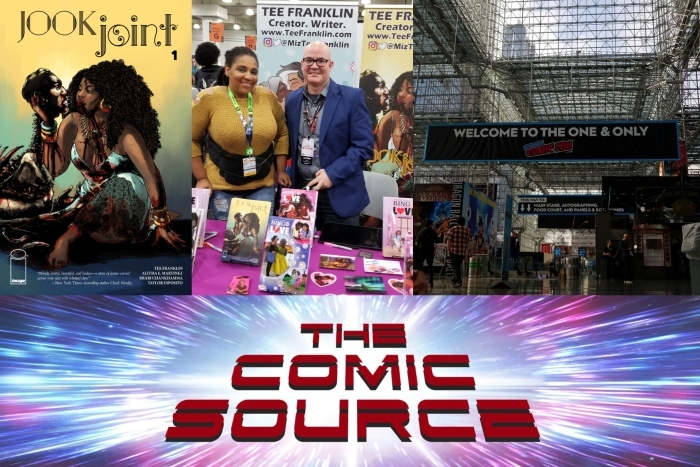 Jace sits down at NYCC 2018 with writer Tee Franklin to talk about her new book Jook Joint. They discuss horror as a means of working through challenges, the setting of her new book and the idea of confronting domestic violence. Also the overriding idea of the book that those who may be suffering from domestic violence are not alone. There is help out there. Tell us about Jook Joint, what’s the story all about? In your first major work you examined love and how inclusive it can be, with Jook Joint it really seems like you are going to the complete other end of the spectrum and examining hate, would you say that is true? One thing that strikes me about the story is how it is inclusive and relatable in its own way, we mentioned the inclusive feel of Bingo Love and hopefully we all love and are loved in one way or another, but I think we all have been touched by domestic violence in one way or another? You are not alone, is certainly a message worth spreading. Even beyond domestic violence, maybe it’s depression or fighting cancer of maybe you just have a tough time making friends. There’s a lot of setting and stories you could have told to examine the topic of domestic violence, why choose horror? How familiar are you with the setting you have chosen in the story? Did you do a lot of research into the setting, time period and voodoo? Anything you can tease about what readers can expect? Is there anything else you would like to share with our listeners? Visit WomenShelters.org to find a shelter near you.